Arriving home this evening, I was greeted by a smell vividly nostalgic as autumn bonfires; a wreath of leather and old leaves, skirling about the house, together with that curious dampness reminiscent of loam. 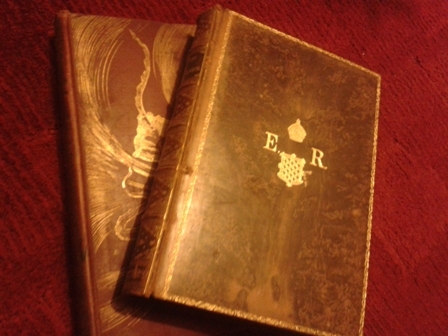 It was in fact the subdued pages of my landlady’s book collection, compiled by her grandfather, an author and journalist; she had drawn out the large box, and was sorting through it in the conservatory, to the delight of the twins. While certainly not TV-culture kids, they are small enough to find excitement in anything truly old. Curious little souls, and never more so than when poring over the grandly bound and textured volumes, stiff as the fingers that would once have creaked over the turning of worlds and lives. In their place, willow-withe fingers went skimming from one crackling page to another, finding the cobweb drawings I too once knew and loved, in my mother’s old Bible. Such a delicate wash of watercolours and fine-line graphite, in a collection wonderfully diverse, spanning Greek philosophy and classic fairytales, Tolstoy and Austen. And, perhaps most importantly, the sensory details to draw one text to another, like stars in a constellation: pages the colour of faded newspaper and bone; black print so carefully aligned and bold with the presence of something done well, which will last through generations. And my favourite – the handwritten scrawls on marbled facing pages, full of love and character. There’s nothing quite like finding a personalized message in a second-hand book (“Merry Christmas / Wishing you well / You were always a dedicated reader of so-and-so / We were once as young as they are”), or a fan of pressed leaves used for an afternoon’s bookmark. As a child, weekends often came with a trip to stay at my grandparent’s house; a sprawling white-brick bungalow of lean, lowlight corridors and rooms filled with miscellaneous items to enchant any age, let alone the inquisitive child I had become. Golf clubs, dust-rimed hardbacks aligned on shelves of dark wood; jars filled with dog biscuits that smelled of old crackers, and timepieces of every shape, size and design, from Granddad’s former employment in a jewellers and as a member of staff at Herstmonceux observatory. His outdoor workshop was a masterpiece of musk, wax and leather, cluttered with trays on the high bench and tools swung from beams; cobwebs swayed in the whisky-hue shadows, and mousetraps lay silent and gleaming in corners like a lick of moonlight from a beady eye. I would stand by the door, hands at my sides and watching his back curled like a comma over whatever clock or watch he happened to be working on. it never fails to amaze me how hands that can restrain a large dog on a leash, are also capable of unpinning time in its tiny clasps, gears and cogs, weaving a dexterous dance to put right whatever went wrong inside, before fitting the pieces back together again. The heady anticipation of those Saturday mornings – waking up in a room not my own, but prepared to feel as such, in that blissful-holiday way grandparents have the knack for arranging. Books that my Nanna knew I would like, were placed at strategic points around the room – on the windowsill, at the foot of the bed, for she knew I preferred curling up cross-legged over perching on a chair. What Katy Did, The Magic Roundabout (Dougal’s musings had me in hiccuping giggles, even as the sly rivulets of humour ran clear over my head), The Animals of Farthing Wood. Sunlight limned the walls with gold, freckling the pleasant internal colours. It was like something from a Joni Mitchell song – Chelsea Morning, perhaps. But no traffic beneath this window, or at least none formed of vehicles – only the military columns of ants scurrying to and fro, marking their drills with hewn leaves and fragments of cat food. The shelters themselves were but a few feet away, and I’d wake to the sounds of discordant mewling as the kennel maids went about their business with trays, brushes and armfuls of hugs. Those boarders were spoilt, really, and rightly so – away from home, immersed in a complex saturation of strange smells, who wouldn’t freak out? I made time to visit each cat – and some of the smaller dogs, with an adult present – on barefoot wanderings of the estate. The beaten track down to the larger kennels was stubbled over with gravel, which made little impact on my small blackened soles. Climbing the green-black trees of the surrounding woodland, book in tow, I’d find a morning could wax into afternoon through the pages. Bark dust laced my hair and hands. Though my parents despaired of ever having shoes on my feet, some sense of public decorum, Nanna was a pro. Taking me by the hand (with that wonderful grin, which could win bites of breakfast out of me even when I’d declared myself not hungry) she’d lead me around town like a Duchess presenting her rarest jewel. Her friends stopped to say Hello – she is well known about town, having worked with the council to rehome stray dogs and cats for years – and I learned to put out my hand and give a firm shake. It always makes me smile when this takes people – particularly men – by surprise. Our steps inevitably took us in the direction of the local police station, for updates and/or any potential pick-ups, if the dog warden had phoned in first. While this environment would form a large part of my future, I had little interest then in the squeaky lino floors and folding shadows of the waiting room, the chatter of radios. There was a far more enticing promise just a block down, which Nanna had discreetly introduced me to as a means of diversion while she handled the sometimes-grim business of abandoned animals. On autumn days, the bookshop on the corner seemed full of bees wax-sunlight, falling in slanting bars over the texts that made up the contours of the main room. Winter, pale light lay in pockets of drifting mist between the eyes and mouths of customers. Every conceivable binder and jacket, glossy and matte and cracked, stood in domino-splendour, or stacked up to the ceiling in jagged columns. All had been printed by the fingers of previous owners, with personal scribbles, dates and names, perhaps a mislaid marker made from a shopping list or forgotten photograph. Maps of the world, lines redrawn and whole countries no longer in existence; these papered the seamed walls, peeking out between scarred shelves and teetering book-towers. Headlines screamed in broad black ink from aged broadsheets, pinned up with the same travel-ease as the maps: the moon landing, the outbreak of the wars, Kennedy’s shooting, the Queen’s coronation. Any spare inch of floor still visible was silvered with dust. No history lesson in school seemed so vital to the senses, or as memorable. Those pages spoke their own language of antiquity, caught between marbled paper; they crackled and hissed, whispered and chattered and chimed, in the way of books that have known many owners and a great deal of usage, with ink blurred beneath passing thumbs and certain corners folded down on thoughtful points. Some were the colour of snow under blueish shadows; others were thick and tough as papyrus, while still others had the distinctly smoked appearance and smell of bacon that you’d more likely find inside an old brass trumpet. The shop as a whole smelled of dens dug into the roots of a gnarled woodland oak. There were no revolving racks, muffins or coffee – except the one mug set down carefully on a ubiquitous pile of books by the shopkeeper’s elbow, twining steam into the thickly piled air. His eyes were the brightest things in the room, darting around to watch each member of the public who entered through the silver-chime door; alive to the faded sound of each page-turn, the low murmurs. Nobody came in as a group, it was too small and cluttered an establishment for that; and though each voice was muted to library tones, perhaps by the weight of knowledge and drifting dust, sound carried through the book columns. The shop owner could pinpoint any conversation by its genre, each of which had been carefully arranged by title and author in latticed grids and sloping bars, an organized chaos of colours and words. There was something otherworldly about the way he carried himself, on slippered feet, up and down the stairs with chin tilted to the ceiling, and fingers buttoned before him. Even as a child, I couldn’t imagine such a man simply reading in the way of other people. There had to be some form of digestion about it, as though he chewed on each text between thoughtful bites of a digestive biscuit, and sips of coffee. I’d won him over on my first visit by pointedly ignoring the modern children’s books – brightly-clothed and scattered towards the rear of the shop – heading instead for the dust-hued titles of my parents’ childhood, and the generations before them. Swallows and Amazons, as Nanna pointed out, had been a favourite of my father’s when he was a boy. Given that I rarely saw him reading, due to long working hours, this came as a pleasant and surprising link between our childhoods. 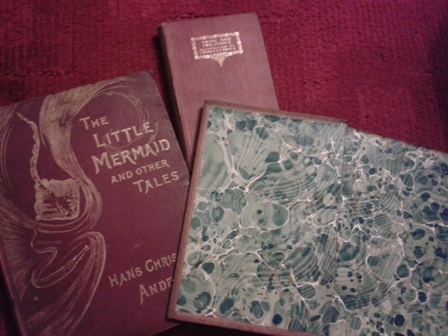 I bought the book, wrapped in its classic binding, and would add to it over the years with titles that trace a pattern between the small person I was and the woman I am today: The Snow Spider trilogy, A Little Princess, Old Possum’s Book of Practical Cats, The Secret Garden. These were to stay at Nanna’s house, as another fixture of our weekends spent together. To come away from the store with a brown paper bag clutched in both hands, crackling under the weight of its precious cargo (and perhaps, later, a smaller bag stuffed with sweets from the indoor shopping centre, weighed out on proper scales) was to know bright-light happiness… The kind to make you climb the tallest tree to waver on the last firm branches, setting the words of each page to the warm evening winds and peach-juice sky. As I grew older, the titles changed with my moods. Pre-adolescent puberty had hit hard; I didn’t dare talk to anyone about it, to show how naive and scared I was beneath the bored sneer that had fish-hooked my mouth. Peers were by turns shocked and amused by each other’s behaviour, and while I longed to emulate them, I seemed to spend most of middle school simultaneously creeping around and backing off; hovering on the fringes of every social cluster, unable (unwilling) to commit and join in. Books were the trusted retreat, as I’m sure will resonate with others. They didn’t answer back with catty remarks, or leave paper-trail rumours. They also didn’t expect anything of my company, and were indifferent as to whether I turned their well-worn pages or not. I went backwards, in an attempt to move forwards: The Great Gatsy, Pride and Prejudice, Animal Farm, Lord of the Rings, Frankenstein. All held issues deeply rooted in social etiquette, gender bias v.s. equality, religion, sexuality and politics; across time-zones and eras, I could pick apart the weave of humanity, while finding my own place in its loose-end threads. Elizabeth Bennett still feels as modern and real as any of my peers, though perhaps better defined in terms of her independence, given the sociocultural aspects of the novel. James Herriot taught me to laugh at my faults, Larkin to find the coil of humour in anything mawkish. Anne Mccaffrey showed me the subtleties of gender equality in her overlap between the fantasy and science fiction genres (never an easy dance). She would prove to be one of the artful authors who know the simple power behind placing human pathos before genre archetypes and settings. While the world of Pern erupted in dragonfire and Threads, and time-travel stitched itself in telekinesis across the stars in the Tower and Hive series, it was the collective thoughts and emotions of the characters that remained very much in the foreground, as something tangible to cling onto. While I wholly endorse e-books, Kindles and similar readers for their “waste-not” convenience – in terms of preserving our planet that little bit longer, providing a welcome market for indie authors/publishers, and the simple pleasure of hauling hundreds of titles around in a compact case – it would be a sad loss for those shops to melt away into the shadows. They are the conduit between one life and another. I’m trying to imagine a childhood without those sensory elements, anchoring me to memories, all caught up in an Eastbourne bookshop (and countless others wandered into over the years.) So many surprises nestled on long-ago shelves, with certain titles eclipsed by the weight of their own historical context. And as with love, it’s the ones you were not looking for that tend to be the keepers. Looking at some of the books in my landlady’s collection, I can only begin to imagine how long it would take to put such a compilation together. Yet they are no more important than the well-thumbed and scrappy paperbacks I have stashed in my walk-in wardrobe – it is ultimately the text caught within that will make a book timeless. But these are the tangible links, to those owners who bothered to stop and pick up a copy and left little imprints on the binders and pages, as a form of communication; to our pasts and our futures, with connections to authors as people with real thoughts, memories of a world like ours, all set down in elegant print defining humanity’s dedication to the written word – often against great odds. The old leaves, musk and marbling, the presentation and fine weave of images, all wait for us to come home, seeking something that belongs here and then.